"Clerks" director Kevin Smith is recovering after he suffered a "widowmaker" heart attack in between two stand-up shows in California. 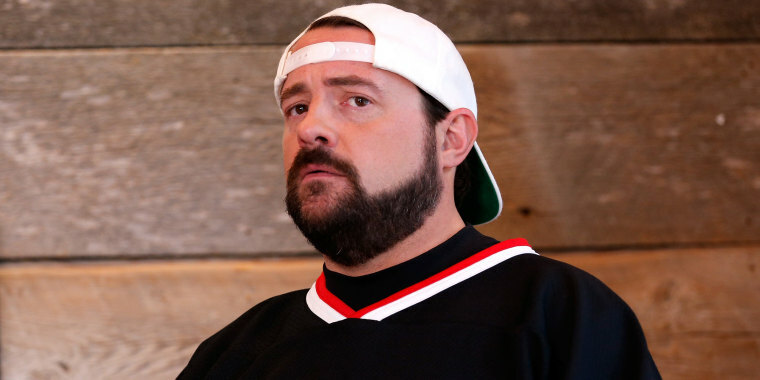 Kevin Smith is thankful to still be "above ground" after suffering what he called a "massive heart attack" on Sunday between shows in California. The "Clerks" director tweeted a selfie from his hospital bed early Monday, saying his doctor told him he had a heart attack from a 100 percent blockage in the left anterior descending artery (LAD), one of three arteries that supply blood flow to the heart. Smith, 47, had been scheduled to perform a pair of stand-up shows in Glendale, California, on Sunday, but canceled the second one when he started feeling ill and thankfully went to the hospital to get checked out. "If I hadn’t canceled show 2 to go to the hospital, I would’ve died tonight,'' he wrote. "But for now, I’m still above ground!" Smith, whose father died from a massive heart attack, wrote a longer post on Instagram in which he described feeling nauseous, sweating heavily and throwing up after his first show while his chest felt "heavy." "But this is what I learned about myself during this crisis: Death was always the thing I was most terrified of in life,'' he wrote. "But even as they cut into my groin to slip a stent into the lethal widowmaker, I was filled with a sense of calm. I’ve had a great life: loved by parents who raised me to become the individual I am. "The point of this post is to tell you that I faced my greatest fear tonight ... and it wasn’t as bad as I’ve always imagined it’d be. I don’t want my life to end but if it ends, I can’t complain. It was such a gift." Smith has been living a healthier lifestyle in recent years, which includes the 85-pound weight loss he showed off in 2015. The father of an 18-year-old daughter was inspired to lose weight by a 2010 incident in which he said he was booted from a Southwest Airlines flight for being too large for one seat. The "Comic Book Men" host said doctors informed him the heart attack he suffered is known as a "widowmaker," which gets its nickname from its low survival rate. Bob Harper, a trainer for "The Biggest Loser," suffered a "widowmaker" last year when he collapsed in the gym and spoke with TODAY in April about the ordeal. "My heart stopped,'' Harper said. "Not to be dramatic, but I was dead. I was on that ground dead." Smith's friends, along with other celebrities, reached out to him with well wishes on Monday. Glad to still have you this side of the lawn. Cheers.